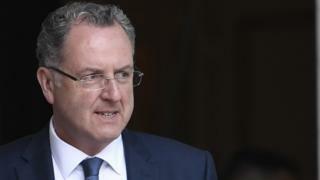 A French prosecutor is investigating alleged financial misconduct by Richard Ferrand, a minister in President Emmanuel Macron's new government. Mr Ferrand's partner, Sandrine Doucen, allegedly profited from a property deal while he was head of a health insurance fund renting office space from her. He denies wrongdoing. Separately, one of Mr Macron's junior ministers is also suspected of financial impropriety. The timing is awkward for Mr Macron, as he launches an ethical standards bill. He has made clean government a flagship policy, after financial misconduct allegations hit his main rivals in the presidential election - National Front (FN) leader Marine Le Pen and conservative Republicans candidate François Fillon. His new centrist party, La République en Marche (Republic on the move), wants to win convincingly in key parliamentary elections this month. Polls suggest the party can win, but the well-established party machines of the Socialists and Republicans are formidable rivals. What are French President-elect Macron's policies? Who's who in Macron's team? Mr Ferrand, who is Territorial Cohesion Minister, managed a Brittany fund called Mutuelles de Bretagne in 1998-2012. A prosecutor in the western city of Brest has opened an investigation to see if any of Mr Ferrand's actions might be deemed illegal. The satirical newspaper Le Canard Enchaîné raised suspicions about Mr Ferrand last week. It also alleged that his son had worked as a parliamentary assistant in 2014, which the minister dismissed as minor work which lasted for only four months. Meanwhile junior European Affairs Minister Marielle de Sarnez is among 19 French MEPs under investigation over their hiring of assistants. Seventeen of them - including Ms Le Pen - are in the FN. Ms Sarnez denied wrongdoing and threatened to sue the FN member who made the allegations against her. Parliamentary assistants on the EU payroll in Strasbourg were allegedly given work in French national constituencies, which violates EU rules. At a cabinet meeting on Wednesday, President Macron urged his ministers to show "solidarity" and "responsibility". Mr Macron is against MPs working as consultants or employing family members. Macron: Who's who in the French president's team? Emmanuel Macron: What's inside the 'Big Mac'?